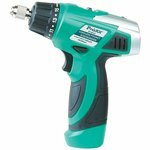 Power tools for fast and easy screwing and unscrewing fasteners: screws, nuts, bolts, etc. The packaging of some electric screwdrivers includes bit sets for any purposes. 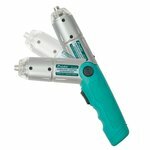 These tools are compact and ergonomic. 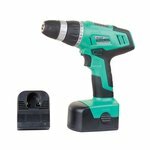 A cordless screwdriver with set of bits (11 pcs: slotted, crosshead and torx tips) and rechargeable battery. Rated no load speed 250 rpm. 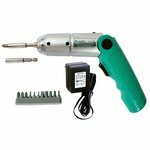 110 V.
A cordless screwdriver with set of bits (11 pcs: slotted, crosshead and torx tips) and rechargeable battery. Rated no load speed 250rpm. 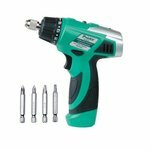 A cordless screwdriver with rechargeable battery and adjustable torque settings for screwing and drilling. 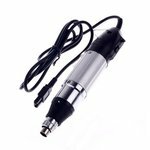 A cordless screwdriver with set of bits (4 pcs: slotted and crosshead) and rechargeable battery. Rated no load speed 160 ~ 320 rpm.